Big News: OUR DOSSIER IS IN ETHIOPIA!!! Somewhere in Addis Ababa is a packet of papers that will change a lot of lives. We now await a court date to officially adopt Tedi. After we pass court, we travel to get him in 6-8 weeks. It could take us two weeks to get a court date or it could take six months. You never know. Having said that, it seems throughout this entire process, God has been saying loudly that He wants Tedi home quickly. The only thing left for Natalie and I to do is to pay the remainder of our agency fees and then pay for travel. The amount is still daunting but we know that God knows exactly where every penny is and will bless us with it in His time. For those of you that did not know, Natalie and I attended the Adopting for Life Conference this past weekend (info here: http://events.sbts.edu/adopting-for-life/ ). It was held at the Southern Baptist Seminary in Louisville and hosted by Dr. Russell Moore, a dean at STBS and minister at Highview Baptist Church. Moore has written what is probably the foremost book on Christian adoption, called Adopted for Life. This book tells not only of Moore's experience of adopting two sons from Russia but also delves into the theology of adoption. By this, I mean that Moore lays out the reasons why Christians are called to care for orphans. The book is a slow, deep read. My friend Phillip tried to read this book while trying to read 52 books in one year and he said this book was the most difficult. I encourage everyone to read it but don't expect it to be light and fluffy. It is definitely dense and tedious. -He spoke about the church's not-so-distant history of turning a blind eye and deaf ear from social injustice. Unfortunately, this message still needs repeating in a lot of churches in America. -He said that you cannot separate God's message from social injustice. -He detailed how our treatment and adopting of orphans is a tangible example of God's love for us. Moore believes (as we do) that if you believe the Gospel, you must be driven to adopt. -Prosperity and an apathetic attitude kills just as HIV and Malaria do. -God ALWAYS knows what He is doing. This was especially poignant to those of us that have attempted to have biological children and have been plagued with infertility. -God often sets the stage for triumph and faithfulness with suffering and intense sorrow. -The American church is not a reflection of James 1 and 2. Sidenote: if you want to rock your world and the way you view your church, read these two chapters. There were many other cool organizations on hand. Natalie and I have applied for some adoption assistance with several companies and two of them were present. We met Lindsey, her husband Chris, and their beautiful daughter from Guatamela, who work with Show Hope, an adoption aid organization started by Steven Curtis Chapman (the very successful Christian singer). We also met Leah and Christi who work with Life Song, an adoption aid organization located in Illinois. I was glad we got to meet these wonderful people and share a bit more of our story with them. I feel it is hard to tell our wonderful adoption story through the applications we filled out. I mean, there is only so much my 2007 Tax Return says about my love for orphans! We also had numerous friends that attended this conference, especially from our days at WKU. It is always good for the Toppers to represent! We also got to see several families that have adopted from Arise or are in the process. One couple, William and Charis have their second court date (they did not pass the first time) on Friday. We are hoping they officially get their little girl. Please keep them in your prayers. The most exciting thing for Natalie and I is that we have friends and acquaintances who are talking more about adoption and orphan care. We are not claiming any of the credit for people considering adoption (all that goes to God placing the desire and burning in someone's heart), but I think that the church is slowly starting to realize that "we" have neglected the subject of adoption for too long. Our goal in this entire process has been to obviously bring Tedi home, but additionally, to be used by God to bring attention to the desparate need (in Africa especially) that exists in our world. After we left the conference, we dropped off T-Shirts to James and Brittney Armstrong. They adopted a baby boy named Dawit from Ethiopia just one month ago. We had never met them but we have both followed each other's blogs for some time. Dawit is one of the cutest babies ever. His picture with our T-Shirt is below. James and Brittney also told us more information regarding Tedi. They said he is very sweet and quiet (he takes after Natalie in both regards). We asked them many questions about their trip to Ethiopia. They are a great resource for us. It's so refreshing to see people on the other side of adoption. It proves to us that all the hassle and paperwork is worth it when we get to hang out with little ones like Dawit. I think he looks pretty cool in our shirt! We got an email late last night that our DOSSIER is en route to ETHIOPIA!!!!! We are so pumped and yet amazed. We had no idea it would be so fast. I guess God knew, but we didn't. Next step: pay the second $3000 fee in order to WAIT for a court date. Thankfully we are over half to the three thousand and will hopefully have the full amount once all of the t-shirts are paid for!!!!!! Once we have a court date (we do not know how long this takes), we pray to "pass court". Once you pass court, you travel to get your child, or in our case TEDI, in 4-6 weeks! I am also excited because we are in Louisville this weekend for the Adopting for Life conference. We get to see our college friends Jenny and Stuart Borders (Patroling the Borders to the right). We are also going to meet The Armstrongs for the first time ever (armstrong adventures to the right) Then tomorrow after the conference we are heading the Lexington to meet one of my best friends, Jacqueline, for dinner....celebrating my bday a bit late. It is more like a birth-week for me this year since my in-laws took me to Cheesecake Factory last night for bday. Sorry this is rushed. JT is kind of dragging me out the door. I still love him though!!! I have written before about Hensley on our blog. 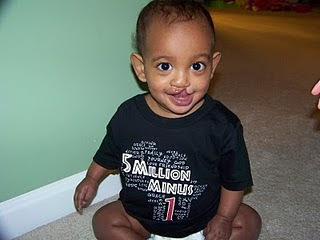 He is the son of our friends Meredith and Curtis, and he came home from Ethiopia on January 1, 2010. His daddy order several t-shirts, 25 actually, from us and came to get them tonight. His wife was gone so we had the pleasure of eating with him and Hensley. Before they left, I had have Hensley model his tshirt. Though he was not all smiles, I promise he was happy to do so. He and his dad were a great treat after a very long day at work. In other news, another one our favorite little girls, Stella, (pictured in the last blog and in The Sister Stories to the right) is always good for a GREAT story. Her mom, Emily, called me tonight to tell me what happened today. I am not a good story teller but I will do my best to recount the precious story. Emily went to pick Stella up at her "school" (half days twice per week). Emily was looking at the picture Stella had drawn which pictured a little boy and a little girl. The little girl and boy were dressed in bright colors but the little girl had dark brown skin on the arms and the face while the boy's were colored in pink. On the way home, Emily asked Stella about her picture. Stella explained that she wanted the little girl to have "brown skin like Tedi's" and the boy to have "pink skin like mine". 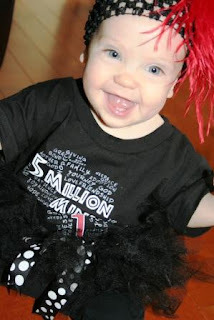 Also, the other day Stella told her mom she wanted to give all of her t-shirts to Tedi's "or-san-age" (not orphange), even her Wiggles tshirt, which is her favorite. What a precious little girl with a big heart! My dear, dear friend Emily (who was the genius that came up with the ornament idea) has been so supportive of our adoption process. Emily's husband Jason is one of JT's closest friends and he was the minister that married us. Obviously, they are very close to our hearts and we covet our time with them. Their oldest daughter, Stella, may be the MOST excited person, other than us, about Tedi coming home . She tries to text Tedi in Ethiopia. She tries to make her mom buy him Jolly Ranchers.... 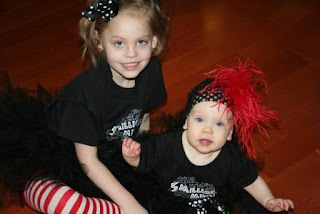 Anyhow, Stella and her little sis, Vivian, had to have shirts. Unlike me and somewhat unlike her mother, Stella is dramatic and very "girly". 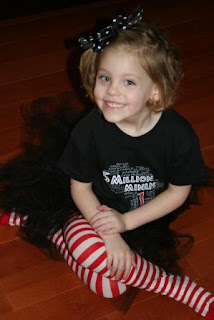 So when her mom asked her to model her "Tedi T-Shirt", the below pictures evolved. Stella chose her little sister's hair piece and her own tights. I could not have asked for better models....much better than myself. 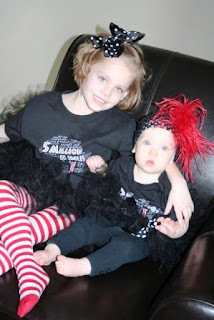 (Check out the Fox's blog to the right "The Fox Sisters") We are placing our second order tomorrow or 145-150... that will put us close to 300 shirts, which is so amazing. Let us know if you want as we are going to continue to take orders. I read an article tonight about a story that will be aired on CBS news. It is looking into unethical Ethiopian adoptions. I did not watch the piece but the article focused specifically on one agency. They were discussing human trafficking being disguised as adoptions and talking about some agencies paying the families for the children. It breaks my heart because I know this does indeed happen. What saddens me even more is that the agency in question is a "Christian" organization. As Christians, we are called to care for orphans, either by adopting, funding adoptions, or otherwise. By exploiting the very children God wants to protect and love, agencies like this make the intentions of Christians look perverse at worst and self seeking at best. I guess I am even more disturbed by this because I can not ever imagine doing such a horrendous thing. We chose to grow our family through adoption and felt called to do so internationally. We felt the pull of a country stricken with AIDS and famine and a place whose borders are plagued with the issues of children being swept away to become child warriors. I would never stand for such unethical practices and I abhor the mere thought. With this being said, I am also glad that agencies in Ethiopia and around the world are held accountable for such travesties. Light should be shed on those harming children in anyway whatsoever. I am going to be a pediatrician and any injustice or pain dealt to a child I take very personally. Because of the money-hungry, unethical and preposterous behaviors of some, our prayerful, carefully planned Ethiopian adoption could be slowed or put on hold. All I and we can do is to pray for the safety of those orphaned in Ethiopia and around the world. We can also pray for those who initiated such actions that their hearts will be changed and they will realize their iniquities. I do not really know what else to say about this topic, but I thought it deserved discussion. I give all myself.to you. Yes i give all myself. And i give all myself.to you. Thank you for those that have already purchased!!! If you purchased on the first order, you should have your shirt soon! Thank you!!! 8:30pm: sorting tshirts and packaging ones to be shipped. Like I said, a busy, busy day. BUT a big day. OUR DOSSIER IS DONE!!!!!! It is now on its way to the agency. From there it will be sent to Washington DC (hopefully this week) to be sealed on the national level, then to Ethiopian Embassy and then to Ethiopia!!! I do not know how long this will take but I am praying by the beginning of March or soon thereafter it could be on its way to Ethiopia. Now, we just have to mail a $3000 check for the translation of the paperwork ASAP and another $3000 check for official referral fee. We should have the first check ready to mail this week and are praying our tshirt sales will continue and help with second fee very soon. After these amounts are paid, we just wait for a COURT DATE. Once we pass court, we will owe $3000 more to our agency and then have to pay for travel cost. Also, once we pass court, we will go get Tedi 4 to 5 weeks later. HOW AWESOME!!! So now, fundraising and waiting are on our agenda.... but like the quote in the previous post talked about ..... it is who we become in the waiting. Thank your for support, everyone out there! We are so amazed at the outpouring of support and love. Thank you!!! JT and I found this great Africa decal with the heart cut out as Ethiopia on etsy.com.... The family who sells them have recently adopted an adorable girl. Their blog is http://happysagers.blogspot.com/. Check it out! Also, let us know if you would like T SHIRTS!!! "An Introspective Look at African Culture"
Tonight JT and I went to a talk (title above) tonight at the local community college. As a whole, Somerset does not have lots of cultural activities, especially centered around Africa. In honor of Black History Month, the college is having several guest speakers. Tonight, John Wilson, a former missionary to Namibia, South Africa, Swaziland, and Somalia, spoke about his cultural experiences throughout his seven years in Africa. It was very interesting to hear his experiences with different tribes, weddings, funerals, travel, food and such. He was in Somalia three months before our military came in and stayed three months into their occupation. What an interesting story he had.... Another lady, Wanda Dodson who had traveled to Ghana, spoke of her experiences with starting a kindergarten school called the Kentucky Academy. I took some pictures of their artifacts and souvenirs. I wanted to post a short update to celebrate my Grandma's 80th birthday. Her actual birthday is tomorrow but we had a large surprise party for her. Over 50 people came to her party. She is not in good health right now and we were hoping this would cheer her up. I think at least for the time it did cheer her up. My mom and her sister Pam and sister in law Libby did a great job putting it together. My cousins and family from Ohio made the six hour round trip. It was a nice family time. Please keep my grandmother in your prayers....she definitely needs it. This week we placed our first t-shirt order of 160 shirts! We found out there is only a one week turn around on the shirts. I am pumped! We should have our first order in our hands Tuesday. We also found we are able to order shirts as small as 0-3 months! The tshirts, thus far, have been a great fundraising idea. Hopefully, once we collect the money for the first order, we should be able to pay our next $3000 agency fee. That will be amazing and only leave us with $6000 more to pay the agency. God really has been good to us in many way, the finances for our adoption are just one of them. We have my grandma's 80th birthday party and Super Bowl on Sunday so hopefully I will have some pictures to post! Have a great weekend!